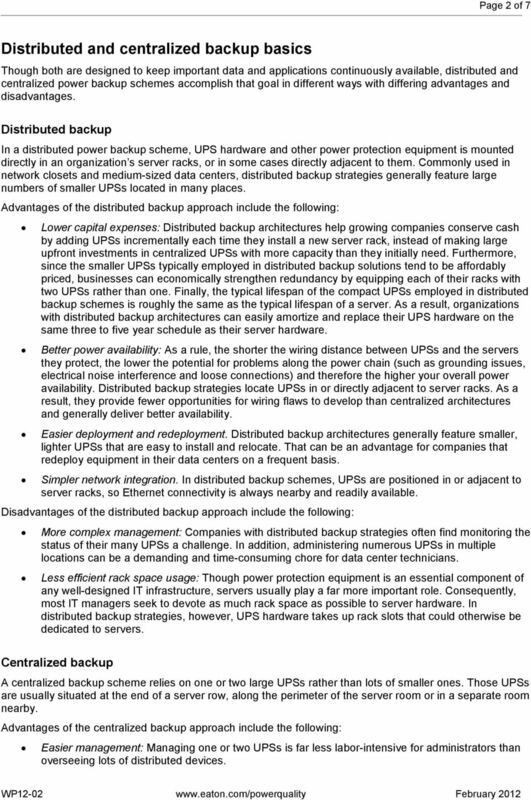 Download "Distributed versus centralized power backup strategies"
2 Page 2 of 7 Distributed and centralized backup basics Though both are designed to keep important data and applications continuously available, distributed and centralized power backup schemes accomplish that goal in different ways with differing advantages and disadvantages. Distributed backup In a distributed power backup scheme, UPS hardware and other power protection equipment is mounted directly in an organization s server racks, or in some cases directly adjacent to them. Commonly used in network closets and medium-sized data centers, distributed backup strategies generally feature large numbers of smaller UPSs located in many places. Advantages of the distributed backup approach include the following: Lower capital expenses: Distributed backup architectures help growing companies conserve cash by adding UPSs incrementally each time they install a new server rack, instead of making large upfront investments in centralized UPSs with more capacity than they initially need. Furthermore, since the smaller UPSs typically employed in distributed backup solutions tend to be affordably priced, businesses can economically strengthen redundancy by equipping each of their racks with two UPSs rather than one. Finally, the typical lifespan of the compact UPSs employed in distributed backup schemes is roughly the same as the typical lifespan of a server. As a result, organizations with distributed backup architectures can easily amortize and replace their UPS hardware on the same three to five year schedule as their server hardware. Better power availability: As a rule, the shorter the wiring distance between UPSs and the servers they protect, the lower the potential for problems along the power chain (such as grounding issues, electrical noise interference and loose connections) and therefore the higher your overall power availability. Distributed backup strategies locate UPSs in or directly adjacent to server racks. As a result, they provide fewer opportunities for wiring flaws to develop than centralized architectures and generally deliver better availability. Easier deployment and redeployment. Distributed backup architectures generally feature smaller, lighter UPSs that are easy to install and relocate. That can be an advantage for companies that redeploy equipment in their data centers on a frequent basis. Simpler network integration. In distributed backup schemes, UPSs are positioned in or adjacent to server racks, so Ethernet connectivity is always nearby and readily available. Disadvantages of the distributed backup approach include the following: More complex management: Companies with distributed backup strategies often find monitoring the status of their many UPSs a challenge. In addition, administering numerous UPSs in multiple locations can be a demanding and time-consuming chore for data center technicians. Less efficient rack space usage: Though power protection equipment is an essential component of any well-designed IT infrastructure, servers usually play a far more important role. Consequently, most IT managers seek to devote as much rack space as possible to server hardware. In distributed backup strategies, however, UPS hardware takes up rack slots that could otherwise be dedicated to servers. Centralized backup A centralized backup scheme relies on one or two large UPSs rather than lots of smaller ones. Those UPSs are usually situated at the end of a server row, along the perimeter of the server room or in a separate room nearby. Advantages of the centralized backup approach include the following: Easier management: Managing one or two UPSs is far less labor-intensive for administrators than overseeing lots of distributed devices. 3 Page 3 of 7 Simpler redundancy: Adding redundancy to a distributed backup scheme requires companies to install two UPSs in each of their server racks, doubling the already sizeable number of devices they must monitor and manage as well as the amount of rack space they must dedicate to power protection. Redundant centralized power strategies require just two UPSs, rendering them much easier to administer. Better use of rack space: By locating UPSs outside the rack, centralized backup strategies leave more space for server hardware. Three-phase power protection: The smaller UPSs typically used in distributed backup architectures generally provide single-phase power protection only. However, high-density server equipment such as blade servers often runs on three-phase power. The larger UPSs employed in centralized backup schemes can protect both three-phase and single-phase electrical loads. Longer battery life in high-temperature environments. Thanks to research proving that companies can safely operate servers at temperatures as high as 80 o F/27 o C or above, server rooms are often far warmer these days than was once common. Such hot conditions can significantly shorten the lifespan of a UPS battery. In a centralized backup scheme, batteries are typically located in a cooler space outside the data hall, so they tend to require replacement less frequently. Figure 1. 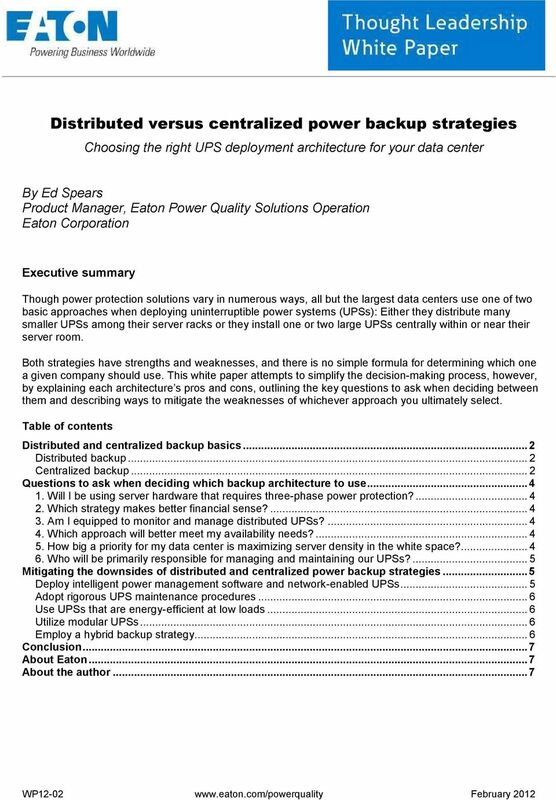 Centralized power backup strategies rely on one or two large UPSs. Disadvantages of the centralized backup approach include the following: Higher capital expenses: The large UPSs utilized in centralized backup strategies are generally far more expensive than the smaller devices used in distributed architectures. Lower energy efficiency: To accommodate future growth, most companies with centralized backup schemes deploy UPS hardware with more capacity than they initially require. Consequently, their UPSs are lightly loaded at first and often as little as 75 percent efficient. That means up to 25 percent of the power those UPSs consume ends up being wasted. To make matters worse, all of that wasted electricity is ultimately emitted as heat, putting extra burdens on data center cooling systems and further driving up energy costs. 4 Page 4 of 7 More complicated network integration. In centralized backup schemes, UPSs are positioned outside the data hall in rooms that may not have ready access to Ethernet connectivity. Questions to ask when deciding which backup architecture to use Though there is no easy way to determine whether a distributed or centralized backup strategy makes more sense for your data center, here are six key questions to ask during the decision-making process: 1. Will I be using server hardware that requires three-phase power protection? If so, a centralized power backup scheme is probably your best option, as few of the rack-mounted UPSs used in distributed backup strategies offer three-phase power protection. 2. Which strategy makes better financial sense? Answering this question involves weighing multiple considerations: Sensitivity to capital expenses: Companies looking to limit capital expenditures tend to prefer distributed backup schemes, since they allow you to buy additional UPS capacity gradually over an extended period of time, rather than all at once upfront. It s worth noting, however, that many growing companies with a distributed backup strategy eventually wind up switching to a centralized architecture when the sheer volume of UPS hardware in their data center becomes unmanageable. In such cases, total capital outlays over multiple years can easily add up to a sum greater than the cost of simply utilizing a centralized approach from the start. Assuming they have enough cash on hand to afford it, organizations with enough confidence in their growth projections to foresee a likely need for large, centralized UPSs within a few years time should carefully assess the wisdom of going straight to a centralized backup approach rather than using a distributed one first. Sensitivity to operating expenses: For businesses eager to limit operating expenditures, centralized backup strategies have both strengths and weaknesses. On the one hand, they usually require less administrative overhead. On the other, their lower initial energy efficiency typically translates into higher electricity spending. Pros and cons with a distributed backup strategy are exactly the opposite: Management costs tend to be higher than with centralized architectures but energy spending tends to be lower. 3. Am I equipped to monitor and manage distributed UPSs? Administration is one of the top challenges associated with distributed backup schemes. Companies considering a distributed approach, then, should evaluate their readiness to monitor and manage potentially large numbers of UPSs scattered across their data center. 4. Which approach will better meet my availability needs? As noted earlier, distributed backup architectures tend to deliver better power availability, since they position UPSs in close proximity to the loads they re protecting and the failure of a single UPS affects only a small portion of the data center. Companies with an extremely low tolerance for downtime such as hospitals and stock trading firms may therefore be better off adopting a distributed backup strategy versus a centralized one. 5. How big a priority for my data center is maximizing server density in the white space? In distributed backup architectures, UPSs and batteries occupy rack space that otherwise could be dedicated to servers. As a result, organizations that wish or need to fit as many servers as possible into their white space usually choose to place UPSs in their grey space by adopting a centralized backup scheme. This is especially true of smaller installations with a limited number of racks. 5 Page 5 of 7 6. Who will be primarily responsible for managing and maintaining our UPSs? As a rule, facilities managers are more familiar and hence comfortable with centralized backup architectures, while IT managers are more comfortable with distributed ones. For that reason alone, companies that give primary responsibility for UPS management to their facilities department often choose a centralized backup scheme, while companies that place their IT department in charge of UPS administration go with a distributed scheme. 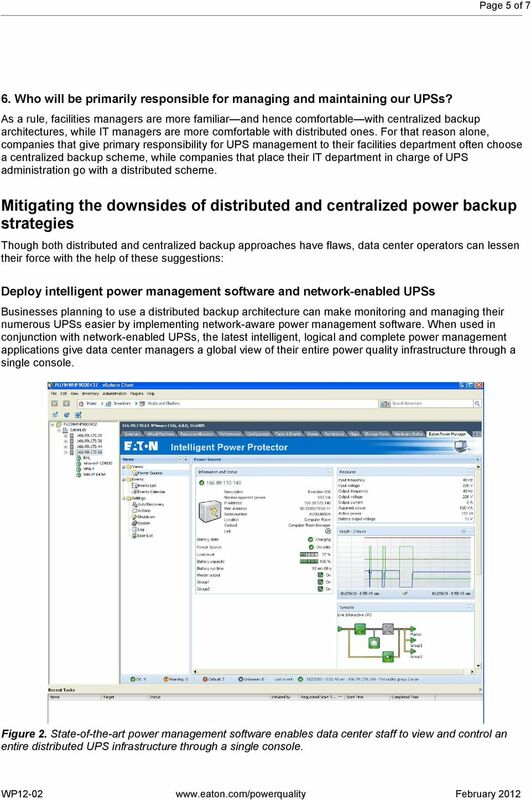 Mitigating the downsides of distributed and centralized power backup strategies Though both distributed and centralized backup approaches have flaws, data center operators can lessen their force with the help of these suggestions: Deploy intelligent power management software and network-enabled UPSs Businesses planning to use a distributed backup architecture can make monitoring and managing their numerous UPSs easier by implementing network-aware power management software. When used in conjunction with network-enabled UPSs, the latest intelligent, logical and complete power management applications give data center managers a global view of their entire power quality infrastructure through a single console. Figure 2. State-of-the-art power management software enables data center staff to view and control an entire distributed UPS infrastructure through a single console. 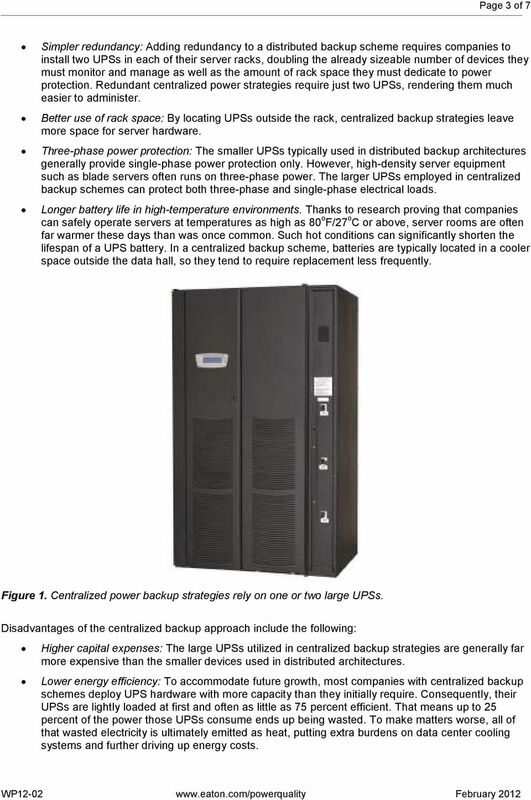 6 Page 6 of 7 Adopt rigorous UPS maintenance procedures Another way to simplify management of distributed power backup architectures is to employ thorough, documented maintenance procedures, such as those contained in the Information Technology Infrastructure Library (ITIL). Developed by the British government in the 1980s, ITIL defines specific, effective and repeatable ways to handle incident management, service desk operation and other common IT tasks. Even in data centers with large numbers of UPSs, performing administrative tasks in consistent, repeatable ways can significantly lower the likelihood of power failures while also increasing the productivity of data center technicians. Use UPSs that are energy-efficient at low loads One drawback of centralized backup strategies is that the large UPSs they rely on are often lightly loaded at first and hence inefficient. However, companies can reduce the resulting wasted energy and heightened cooling demands by deploying UPSs designed to be efficient even under low loading conditions. UPSs with state-of-the-art, multi-mode conversion capabilities, for example, are highly efficient even when less than fully utilized. Utilize modular UPSs Building your power protection architecture around modular UPSs can be a best of both worlds solution to the distributed versus centralized backup dilemma. Much like blade servers, modular UPSs enable multiple plug-and-play power units to share common electrical feeds, power supplies and cabling. Some designs provide up to 50 or 60 kw of capacity in 12 kw building blocks; larger ones can be augmented in 200 to 300 kw increments. Either way, data centers can simply plug in another power module whenever their requirements increase. The end result is a redundant backup scheme endowed with both the manageability of a centralized strategy and the affordable, pay-as-you-grow scalability of a distributed approach. Available space for additional UPS power capacity and battery runtime Figure 3. 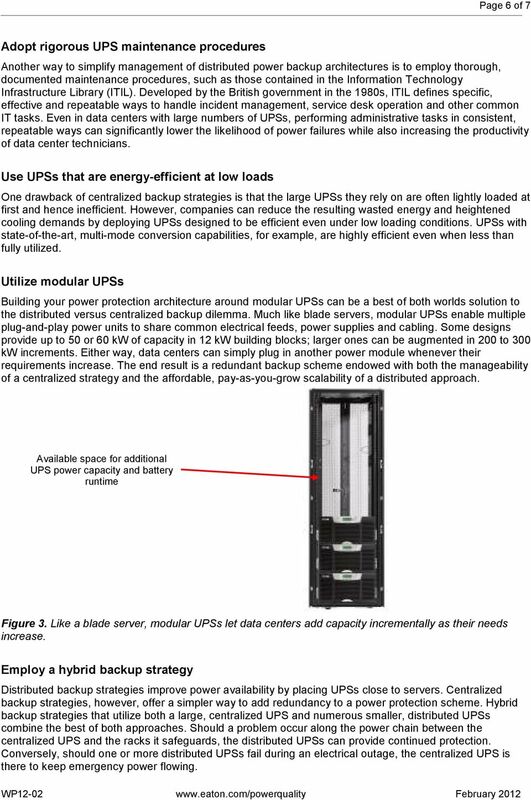 Like a blade server, modular UPSs let data centers add capacity incrementally as their needs increase. Employ a hybrid backup strategy Distributed backup strategies improve power availability by placing UPSs close to servers. Centralized backup strategies, however, offer a simpler way to add redundancy to a power protection scheme. Hybrid backup strategies that utilize both a large, centralized UPS and numerous smaller, distributed UPSs combine the best of both approaches. Should a problem occur along the power chain between the centralized UPS and the racks it safeguards, the distributed UPSs can provide continued protection. Conversely, should one or more distributed UPSs fail during an electrical outage, the centralized UPS is there to keep emergency power flowing. Abstract Is an energy-wasting data center draining your bottom line? New technology options and power distribution strategies can dramatically reduce the cost and carbon footprint of your data center. UPS Basics. Everything you ever wanted to know about uninterruptible power systems but were afraid to ask. IT White Paper. N + 1 Become Too Many + 1? 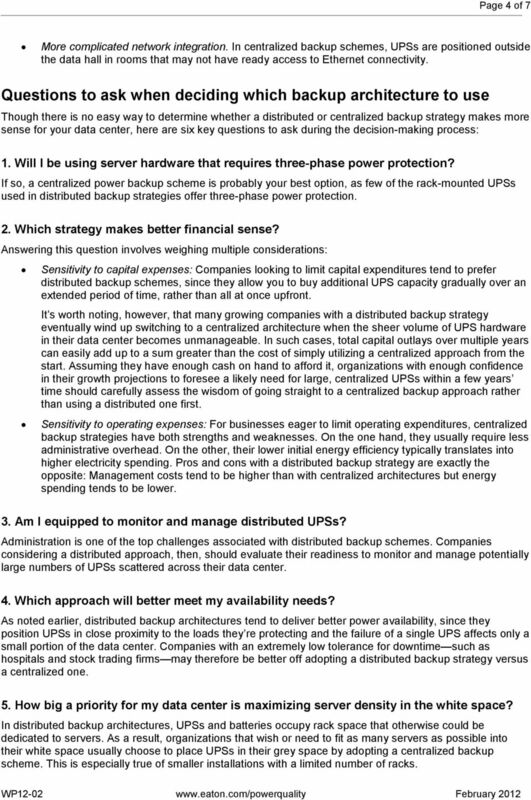 UPS basics Everything you ever wanted to know about uninterruptible power supplies but were afraid to ask. HOW MUCH ARE YOU REALLY PAYING FOR THAT kw OF POWER IN YOUR DATA CENTER? Overview of Green Energy Strategies and Techniques for Modern Data Centers Introduction Data centers ensure the operation of critical business IT equipment including servers, networking and storage devices. 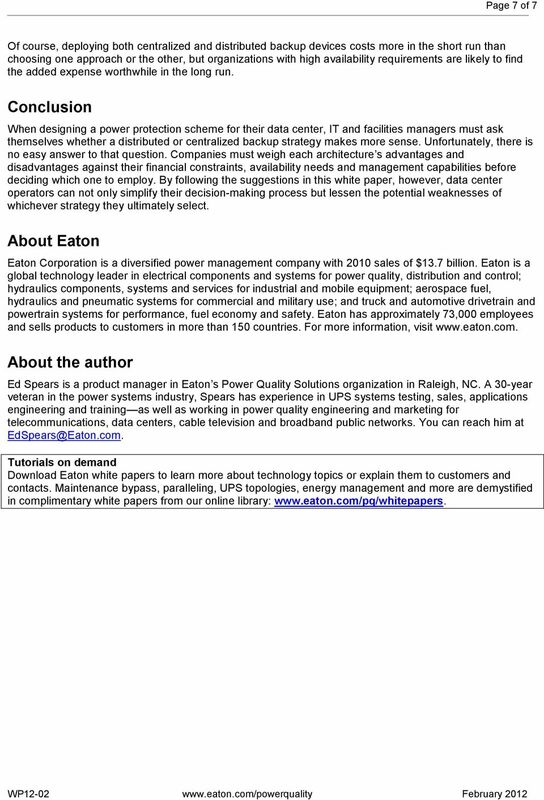 Business Unit Manager, Data Center Solutions, Eaton s electrical group IT managers have more options than ever to tailor the power infrastructure to their unique data center and business requirements. Data Center of the Future. Is it possible to be Efficient, Reliable and Cost Effective? Creating an IT Infrastructure that Adapts to Your Business PLAYBOOK F O R C H A N G E For decades, data centers have been over-provisioned two or even three times over in an attempt to plan for growth.